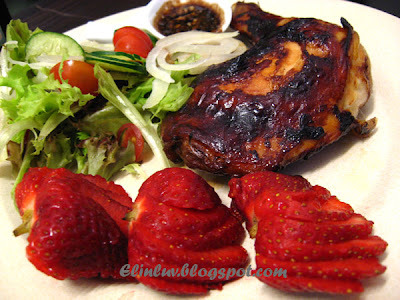 and leave it to marinade for 1/2 hour..
roast for 35-40 minutes till brown and cooked,. mine definitely not brown but a wee burnt..
them to the roast to brighten up the dish. Wow! Looks very delicious! I love meat, but never try this dipping before. Will give it a try..;) Thanks for sharing. Looks like a summer bbq meal! Yum! Hahaha, you are funny, candle light dinner when TNB break down, I must learn this. This is simple and yummy. 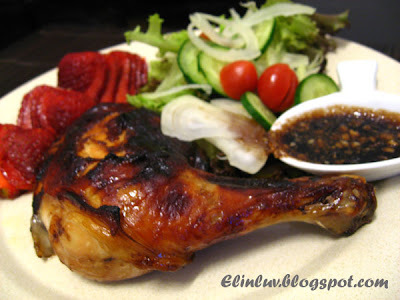 mmm u always make lovely chicken dishes...all the burnt parts are yummy! Hey, having candle light dinner is romantic but not so when TNB breaks down in this weather! We'll be having sauna in our own house! 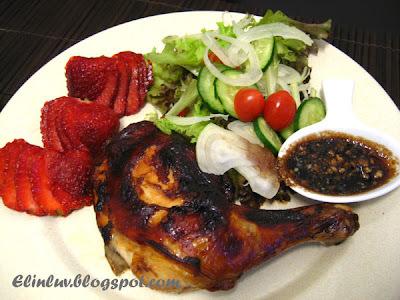 Such simple and delicious chicken dish. Another great dinner in no time, think I also have to try this one, thanks! haha, me too. Can't stop laughing when u mentioned have more candle light dinner when TNB breaks down. Ur chicken looks yummy. One tip for u, brush the honey at the last 10 min only. Brush one side, bake for 5 min and then turn over and bake for another 5 min. It helps for not get rid of the burned skin. Sonia....haha you think Daddy wants candle light dinners now if not for the TNB break down LOL! 27 yrs back YESsss !